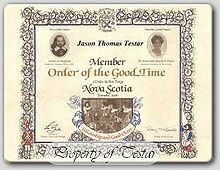 L'Ordre Du Bon-Temps, or in English, the Order of Good Cheer, was founded at Port-Royal at the suggestion of Samuel de Champlain and was chartered under the Royal auspices of the Baron de Poutrincourt and Pierre du Gua, Sieur de Monts. The Order's practices were established by the first Chief Steward Marc Lescarbot. "We meet tonight to witness an event. That will, I pray, go ringing down the years. At marking the sure founding of the Order, Which God and France shall ever serve as beacon to our goal"
Quoting Lescarbot, Rameau writes: "Poutrincourt returned from his excursion on the 14th November, 1606; Lescarbot, who was always full of ideas, and who knew, no doubt, the useful part to be obtained by exterior demonstrations, foresaw to prepare for his honor a quasi- triumphal return from his voyage; Nature itself has already furnished the principle [sic] initiative, and advantage of it had been taken, everywhere were decorations and garlands of natural green; a magnificent forest hid the rusticity of wooden buildings and huts; even a theatre was built where allegoric scenes were represented; there was a feast, a discharge of musketry, and as much noise as could be made by some fifty men, joined by a few Indians, whose families served as spectators." 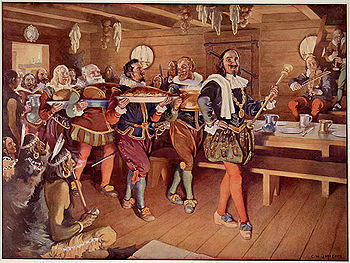 Likely everyone at the settlement took part in the staging of "Le Théâtre de Neptune en la Nouvelle-France," written by Lescarbot and performed at the first celebration Order marking the first theatrical performance in North America. The founding Chevaliers of the Order were those who normally dined at Sieur Poutrincourt's table. The main table of Poutrincourt, in the great hall of the fort was reserved for fifteen gentlemen of birth who are credited as the founding Matries d'Hotel or members of the Order and were known as The Nevoux Noblise of New France. According to official documents - " Baron Poutrincourt was, no doubt, the Grand Knight of the Order, followed by Champlain, Lescarbot, Louis Hébert, Charles de Biencourt, Claude de La Tour, Charles de La Tour, Daniel Hay, the surgeon, Champdore, leaving six unknown, but, the records note that Sagamore Membertou was always treated as their equal, it is quite certain he was at that table, leaving five to be accounted for, if documents to that effect can be found. Lescarbot's account of the Order: is best translated in Murdoch's (v. 1, p 34), in which is described the gathering of the Order, "There were 15 guests (at Poutrincourt's table), each of whom in his turn, became steward and caterer of the day. At the dinner, the steward, with napkin on shoulder, staff of office in hand, and the collar of the order round his neck, led the van. The other guests in procession followed, each bearing a dish. After grace in the evening, he resigned the insignia to his successor, and they drank to each other in a cup of wine. It was the steward's duty, to look to supplies, and he would go hunt or fish a day or two before his turn came, and add some dainty to the ordinary fare. During the winter they had fowl and game in abundance, supplied by the Indians and by their own exertions. These feasts were often attended by Indians of all ages and both sexes, sometimes twenty or thirty being present. The Sagamore, or chief, Membertou, the greatest Sagamore of the land, and other chiefs, when there, were treated as guests and equals." Description of the order of Good Cheer: "The first winters of the French in Acadie were very painful and cost the life of several men. One has to only think of the first winter in the Sainte-Croix Island in 1604-1605 when more than thirty men of the company the sieur de Mons perished by the scurvy. The winters in Port-Royal were less rigorous, but nonetheless long and dull. 2, Rameau de Saint-Père, François-Edme (1889) (in fr). Une colonie féodale en Amérique [l'Acadie (1604-1881)]. 1. Paris: E. Plon, Nourrit et Cie. p. 33. Retrieved 2010-11-26.